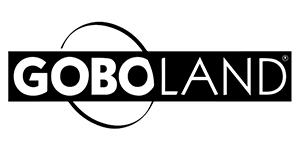 We supply the full range of Goboland and LEE Gobos, one of the broadest ranges of readily available gobo patterns. Known as the Black Steel Collection™ it offers 1,275 designs to choose from. Goboland gobos are manufactured on a patent pending, non-reflective, black-coated steel to enhance image projection. The unique coating does not burn or peel off under extreme heat. Chemically etched on 0.2mm thick steel they are very durable whilst allowing for amazingly fine detail. Goboland metal gobos are designed to give you the perfect combination of high definition and durability. Our larger sizes of gobos are designed with 6 notches around the edge to allow for easy adjustment within profile lanterns, and our smaller sizes of gobos are perfect for moving heads. All Black Steel Collection™ designs can also be made on glass with tabs removed. (tabs are the little tags or bridges which hold a metal design together to stop isolated areas of metal – such as the centre of an ‘O’ - from dropping out.